Looking for a 6 piece patio dining set that will sit 5 with a round table for under $350, this Mainstays Willow Springs patio furniture set from Walmart.com will give you plenty of extra features. With other matching pieces available to make sure that your outdoor decor matches like a swing, rockers, umbrella and stand. 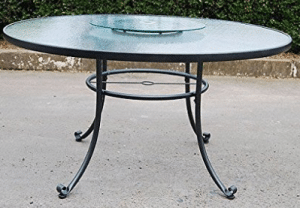 The extra features on this table is the glass lazy Susan that has a hole in it to mount in the middle of the table before inserting an umbrella. If you would like to read more of my information and input on this set, keep reading. This set will arrive in two boxes that will weight about 85 in total weight. The table box will be almost 55 inches square. If you are picking this set up at a local store, you will need a pickup or large SUV to get it home. Two people to handle the large boxes will also be a handy thing to have. This patio furniture set is made with steel frames, no plastic is used. A dark powder coated finish will protect the steel parts. Glass tops for the table and lazy Susan will give you an upscale look. This set will give you five chairs for seating, this is an odd number for most. The table is round with a glass top and decorative legs. There is an umbrella support that attaches between the legs. A glass lazy Susan that has a hold in the middle for an umbrella will allow you to put snacks or other items to pass around to your guest. A matching umbrella and base is available, but not included in the price. The table is 54 inches across and 28 inches tall. The lazy Susan is about 20 inches across and is supported by a plastic piece with rollers in it. The chairs have the same scroll design in the legs as the table. The cushion support is made of steel, so it will not stretch after some time outside. The backs will have a scroll design made of small round bar steel. The metal design of this set will give your outdoor space some updated decor look. The chairs are 26.2 inches wide outside the arms and 22.8 inches wide inside the arms with a seat height of 12 inches without the 3 inch cushions. They are 28.6 inches deep and 34.7 inches tall. Each chair will support 250 pounds. The cushions are the weak point of this set. The material is a blue and white Jacquard woven fabric, not as durable as the Olefin fabric used on other sets. If you want this cushion set to last, storing it when not in use is the best choice. Look at some of my storage solutions here. The cushions are held on by Velcro straps. This set is heavy enough to withstand most windy outdoor environments. The chairs will come assembled and will stack without the cushions. The table will require some minor assembly with tools that are included in the hardware kit. Table will require the top frame to be placed upside down on something that will not damage the painted surface, I like to use the box it came in making sure there are no staples in it. Insert the four legs into each of the slots in the top frame. The center umbrella support will attach to each leg to support the table. Do the final tightening of the screws after the table is back on its legs on a flat level surface for the best results. Inserting the glass top will be the last step before you are ready to use your set. The care of your set will be a simple mild soap and water. Try not to use glass cleaner on the top as it will damage the painted surfaces over time. A liquid wax applied to the painted surfaces will make this set look great and last for a lot longer in the outdoor environment. Cushions need to be stored out of the weather when not in use, replacements are available from the manufacturer for about $40 each. You will have to purchase a whole set as they will not match even a one season fade on color. 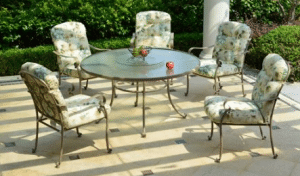 If you have a medium to large outdoor space, this 6 piece patio dining set will work out well. 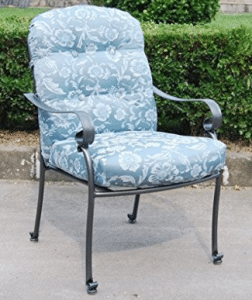 The steel construction of the Mainstays Willow Springs patio furniture set with the powder coated finish will give years of use with little or no work. The cushions are the shortcoming of this set, if you store them properly when not in use, you will get many years of use out of them. Do not leave the cushions outside in the weather if you want them to last. It is a good thing that replacements are offered. The seating for five and other pieces that match will make enjoying your patio furniture a joy. The umbrella and stand shown in the pictures are available at an extra cost. I like the idea of picking up this item at my local Walmart store for no extra charge. Questions or comments will be answered quickly if you use the forms below. Please share this with your friends and family on your social networks. There are some affiliate links in this article, if you use one I will make a small commission and you will not pay anymore. Ok I have looked everywhere for these replacement cushions. Where do I need to go. Use the following information for contacting the vendor. If they cannot help you, find a local company that makes cushions.